No form of exercise is more essential to muscle and bone strength than strength training. Strength training involves lifting weights and/or using exercise bands or tubing. Strength training improves just about every measure of health, including the ability to stay active and independent in your later years. Many people think that strengthening is less important than walking or other forms of aerobic exercise. Not true. Aerobic exercise is important, but people with weak muscles don’t have enough strength to adequately work the cardiovascular system. You won’t. That kind of physique is largely determined by testosterone. Few women produce enough testosterone to produce bulky muscles. For that matter, few men will ever look like Arnold in his heyday no matter how much they work out. Genetics has more to do with bulking up than how much you lift. I’m a good example. I’ve been lifting weights for more than 30 years. I weigh 150 pounds, exactly the same as when I started. When you start strength training, about 30% of the initial improvement occurs because of improved efficiency between your muscles and central nervous system. After that, your muscles start growing — but maximizing muscle size requires specific training, which most people don’t need. Myth: Strength training takes too much time. Actually, it’s among the most efficient forms of exercise. People are told, for example, to walk or get other forms of aerobic exercise for at least 30 minutes most days of the week. With strength training, you need to spend only about 20 minutes twice a week. Many of my clients are busy executives. I typically advise them to go to the gym, warm up with five to 10 minutes of light cardio work (such as walking or running on a treadmill) and then strength train for 15 to 20 minutes. That’s long enough to work all of the main muscle groups. Myth: I can get just as strong with yoga or Pilates. No, you can’t. These activities are beneficial, but they provide only light-to-moderate workouts. They’re useful if you’re just starting to exercise after being sedentary. After that, people tend to “top out” within a few months because the exertion levels don’t change. With strength training, you can constantly change the intensity of workouts by changing the weight and/or repetitions as your strength increases. People who lift weights can double their strength within a year. 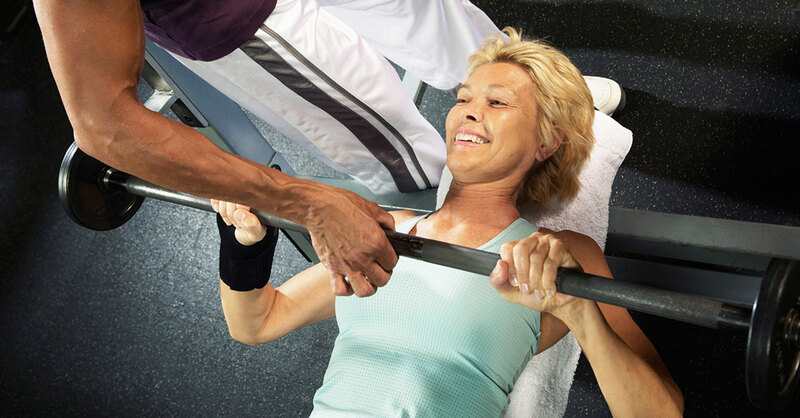 Myth: “Free weights,” such as barbells, give a better workout than machines. They give a different workout. When you lift a barbell or dumbbell, you have to balance the weight in multiple planes. For example, you not only have to lift the weight but also have to prevent it from swaying from front to back or from side to side. This brings additional muscle groups into play. Weight machines allow you to lift in a more controlled manner. There’s no side-to-side or front-to-back movement. There is less stress on the joints, which generally is preferable for older or less fit adults. The machines isolate particular muscle groups, which can give notable gains with less stress.